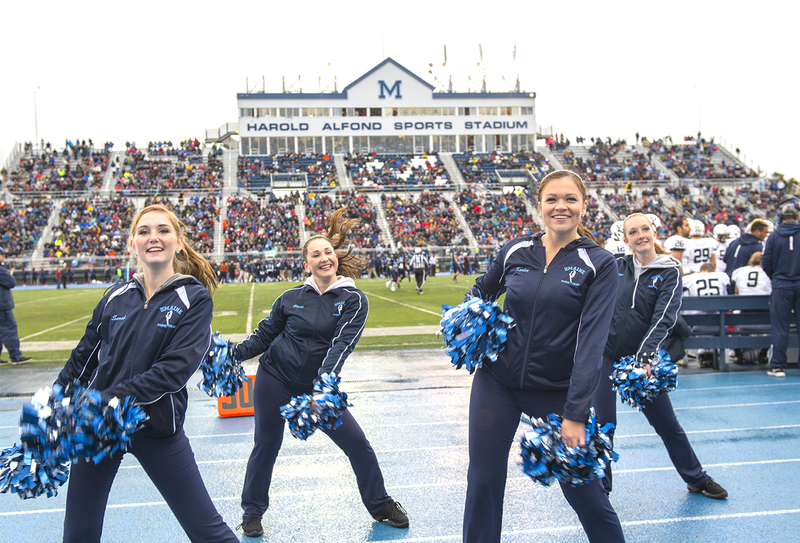 The University of Maine Alumni Association will welcome thousands of alumni and friends to campus during Homecoming weekend on October 14, 15 and 16, 2016. The annual fall weekend combines class gatherings, tailgating, football, the UMaine Alumni Association Homecoming Craft Fair, and a variety of festivities. The UMaine Alumni Association Craft Fair and Maine Marketplace will take place in the New Balance Field House from 10–5 on Saturday and on Sunday from 10 until 4:00. The 167 craft and food vendors will sell items ranging from quilts, jewelry, pottery, fudge, toys, and more. Admission is $2 for adults. Students with a current UMaine ID and children 12 and under are admitted free. During the afternoon on Friday, scheduled tours will be offered of the New Balance Field House, Advanced Structures and Composites Center, Emera Astronomy Center, and a campus walking tour. Visitors can also attend a lecture and panel discussion. Maine teams will host two athletic events during homecoming. On both Friday and Saturday evenings, the Black Bear men’s hockey team will play against Quinnipiac at Alfond Arena. UMaine’s football team will face Albany on Saturday at noon. The Maine Business School, School of Forest Resources and College of Liberal Arts will host events, and the Art department will dedicate the Professor Michael Lewis Painting Studio at the Wyeth Family Studio Art Center. Nearly 300 University of Maine alumni and guests from the graduating classes of 1951, 1956, 1966, and 1971 will return to Orono September 14-17 for class reunions. The event will be extra-special for the Class of 1966, which will celebrate the 50th anniversary of its graduation commencement. Many members of that class have vivid memories from their sophomore year of learning about the assassination of President John F. Kennedy, which occurred just a month after his October 1963 speech at UMaine. In addition, many members of Senior Alumni—UMaine graduates whose graduating class held its 50th reunion in previous years—will also be in Orono to take part in reunion events. Attendees will gather on campus to reconnect, to revisit memorable landmarks, and to tour the many new additions and changes to campus that have occurred since their days as students. The individual classes will also hold class meetings and memorial services, honor recipients of alumni awards, attend a dinner and reception with UMaine President Susan J. Hunter, and meet with current students and faculty members. Many of the returning alumni will attend the September 17 performance of Capitol Steps taking place at UMaine’s Collins Center for the Arts as well as enjoy familiar and new foods and experiences offered by off-campus restaurants and event centers. Other UMaine graduating classes will return to the UMaine campus on Oct. 14-16 for Homecoming 2016. 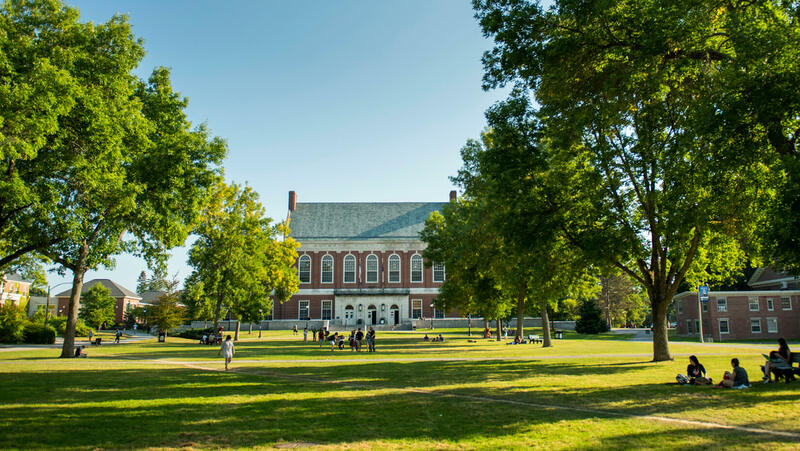 Along with a number of events and activities, special programs and receptions will be held to celebrate the reunions of more recent graduating classes: those between 1976 and 2011 whose graduation year ends in a one or six. Homecoming and class reunions are organized by the University of Maine Alumni Association, an independent 107,000-member organization which supports and advocates for UMaine and its alumni. More information is available at umainealumni.com. 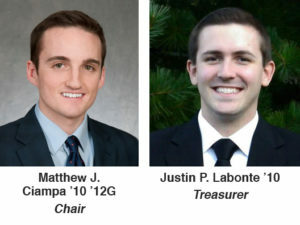 Matthew J. Ciampa and Justin P. Labonte have been elected chair and treasurer, respectively, of the University of Maine Alumni Association’s board of directors. Ciampa, who earned undergraduate and graduate degrees in financial economics from UMaine in 2010 and 2012, is a business analyst at Pingup, a Boston-based startup. He previously worked as a senior economist at CBRE Econometric Advisors, a Boston area commercial real estate business. Ciampa succeeds Nathan P. Briggs, who served as board chair for two years. A native of York, Maine, Ciampa now resides in Boston. Justin Labonte of Lewiston was elected to succeed Ciampa as the association’s treasurer. After graduating from UMaine in 2010 with a degree in accounting and business management, Labonte worked as a senior associate at Ernst & Young’s Financial Services Office in Boston. He recently earned his MBA at Harvard Business School and in the fall will be joining Emerson Electric Co., a Fortune 500 company based in suburban St. Louis. William M. Beaudoin of Boston (Class of 2008), an attorney with the international firm Ropes & Gray. Danielle Burke Ahern of Bangor (2000), a vice president with Bangor Savings Bank. Gustavo Burkett of Dedham, Mass. (2002 and 2005), director of student involvement at Boston College. John Ferland of Cumberland (1976), vice president of project development at Ocean Renewable Power Co. of Portland and president of its subsidiary, ORPC Solutions. Steven W. Hewins of South Portland (1977), a business consultant and former travel industry executive. Elizabeth Jarrell of Cambridge, Mass. (2005), communications director for Massachusetts General Hospital’s Clay Center for Young Healthy Minds. John P. Lalumiere of Watertown, Mass. (2007), manager of corporate financial planning and analysis for inVentiv Health of Burlington, Mass. Julia Munsey of Bangor (2002), a public relations specialist and partner at Dougherty Project Management of Bangor. Founded in 1875, the University of Maine Alumni Association is dedicated to advancing and advocating for the best interests of the University of Maine and its former, current, and future students. 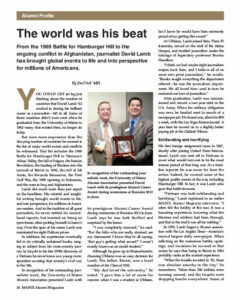 The association has more than 107,000 members living in 50 states and 112 countries. Maine consumers would be willing to pay more for food that is sustainably harvested and some may even be willing to spend extra for seafood harvested in Maine waters, according to a recent survey conducted by researchers in the University of Maine School of Economics. The issue, according to researchers, is that information about the source and sustainable practices of food production isn’t always available. In a survey of more than 1,000 Maine citizens this spring, 75 percent of respondents indicated that they were willing to pay more for sustainably harvested food, and 30 percent believed Maine people are willing to pay extra for seafood from Maine. UMaine Assistant Professor of Economics Caroline Noblet, who collaborates on the research with Associate Professor of Marine Policy Teresa Johnson, says people do care where their food comes from and they might have preferences. But when information is incomplete or unavailable, especially in restaurants, customers’ choices may be impacted. Maine restaurants owners told the UMaine researchers that tourists — not Maine residents — were far more likely to ask about seafood origins. 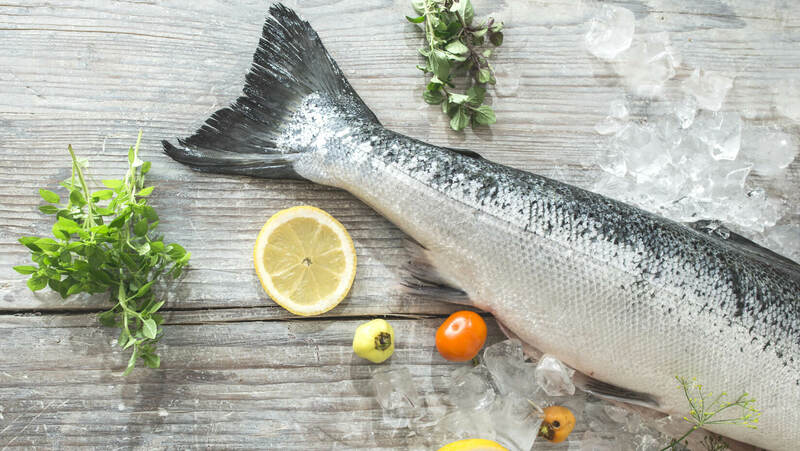 The survey is part of a Maine Sea Grant research project called Seafood Links, studying what consumer perceptions of seafood, and learning how Maine businesses source their seafood. 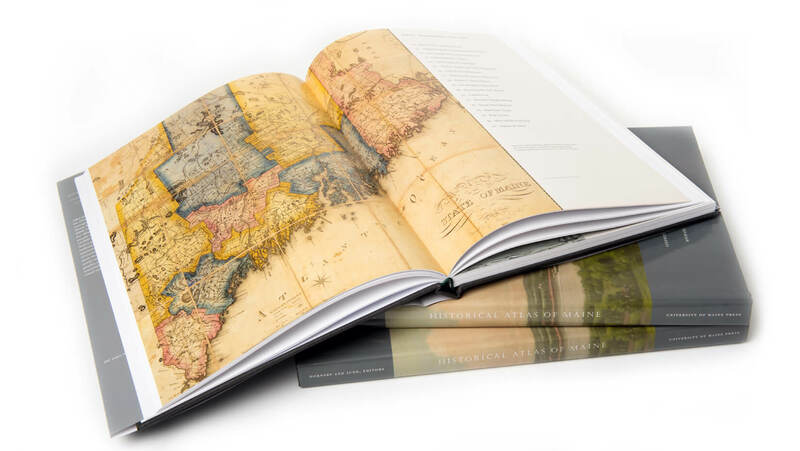 The goal of the research is to increase awareness and availability of local and sustainable options. Also part of the research project, Brianne Suldovsky, a Ph.D. candidate in communication, conducted preliminary interviews with people in supermarkets and at seafood festivals, asking them to write down three or four words they associated with “seafood,” “local seafood” and “sustainable seafood.” Her intent is to evaluate how consumers understand the word “sustainable” in relation to seafood. The University of Maine has been selected as one of 37 institutions nationwide as partners with the Mandela Washington Fellowship for Young African Leaders. Beginning in mid-June, UMaine will host 25 emerging public management leaders from Sub-Saharan Africa for a six-week academic and leadership institute, sponsored by the U.S. Department of State. The Mandela Washington Fellowship, the 2014 flagship program of President Obama’s Young African Leaders Initiative (YALI), empowers young African leaders through academic coursework, leadership training, mentoring, networking, professional opportunities and support for activities in their communities. Fellows are young leaders who have established records of accomplishment in promoting innovation and positive change in their organizations, institutions, communities and countries. The 25 Mandela Fellows at UMaine are among 1,000 young African leaders ages 25 to 35 who were selected from more than 43,000 applications. The fellows are being hosted at institutions across the United States this summer, studying in institutes focused on business and entrepreneurship, civic leadership, public management or energy. In addition, fellows will participate in community programming that offers insights into American culture. 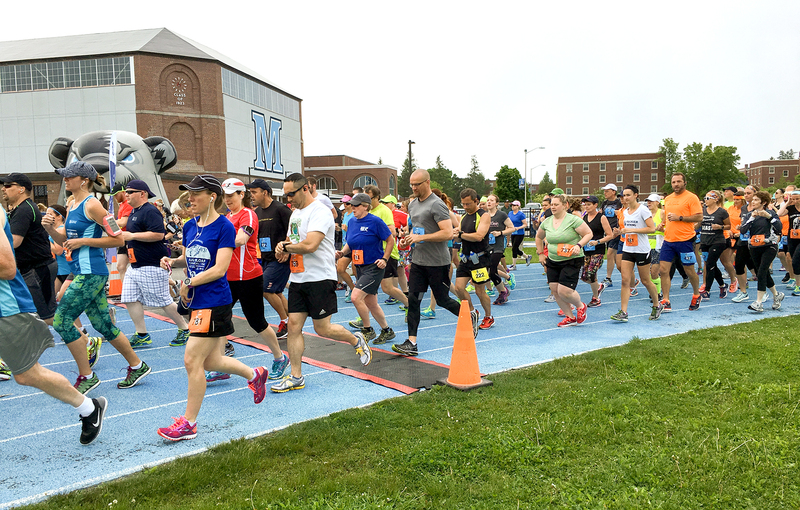 The University of Maine Alumni Association presented the second annual Black Bear Marathon, Half Marathon and 10K on Sunday, June 5. The cool morning offered optimal conditions for the runners. All three races began on the track at UMaine’s Harold Alfond Stadium. The 26.2-mile course, a double loop of a 13.1-mile course, began on the UMaine campus, traveled through Orono and Old Town, and returned to campus on the university’s bike path. The certified course featured cheer stations, music, water, and sports drinks. Two UMaine alumnae won in their categories. For the second year in a row, Tracy Guerrette ’03 was the first woman to finish the marathon. Lisa Wiley Kingsbury ’86 won the 10K. Also among the race participants was Karl Leitz from Jersey City, NJ, who after the Black Bear Marathon has completed marathons in all 50 states. See the list of winners and their race times. 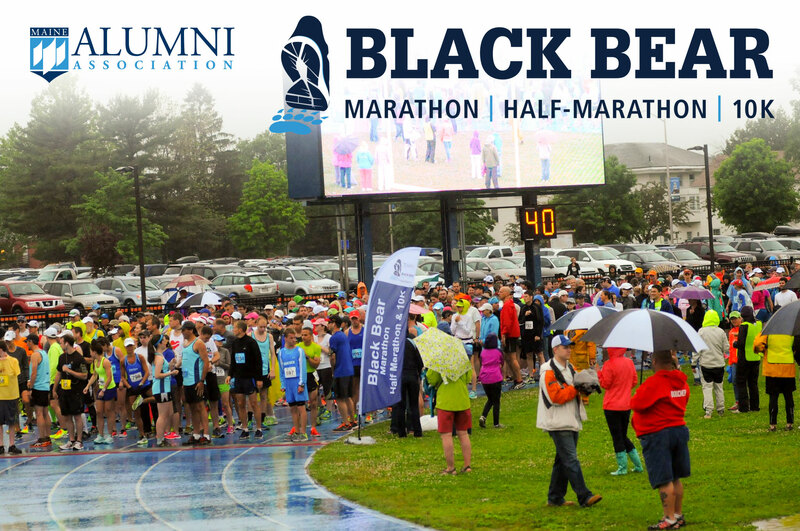 The University of Maine Alumni Association will present the second annual Black Bear Marathon, Half Marathon and 10K on Sunday, June 5. All three races will begin at 7:30 a.m. on the track at UMaine’s Harold Alfond Stadium. There is a six-hour limit for the marathon course. An early start at 6:30 a.m. is available to those who prefer an extra hour to complete the marathon. The 26.2-mile course is a double loop of the 13.1-mile course that begins on the UMaine campus and travels through Orono and Old Town and back to the university’s bike path. The certified course will feature cheer stations, music, water and sports drinks. Registration is online. Fees are $90 for the marathon, $70 for the half and $35 for the 10K. The first 600 runners to register will receive a logo race shirt. Medals will be given to all registered runners who cross the finish line. A race expo and packet pickup will be held 2–6 p.m. Saturday, June 4 in the New Balance Field House on campus. The Black Bear Race series is run by the Student Wellness Resource Center with support from several sponsors. Proceeds benefit the center’s substance abuse prevention services and programs, as well as the Black Bear Exchange food pantry and clothing exchange. Race organizers also plan to form a fundraising partnership with charitable organizations to give back to the community. More information is available on the race website or by contacting Lauri Sidelko at sidelko@maine.edu, 581.1423.